South African white supremicist leader Eugene Terreblanche, pictured in 2004, was bludgeoned to death on his farm. 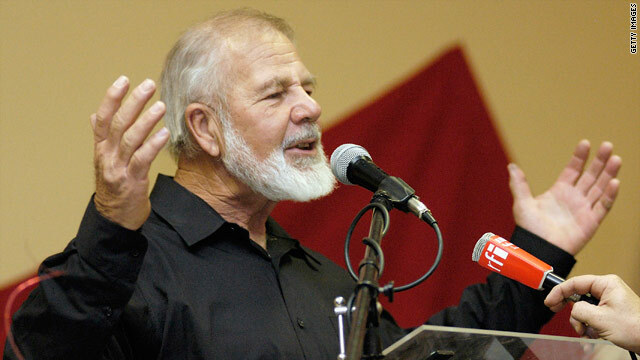 Death follows ban last month of ANC political song "Kill the Boer"
Johannesburg, South Africa (CNN) -- The right-wing white supremacist leader Eugene Terreblanche was probably one of the most divisive and least likable characters in recent South African history. Not many people in South Africa would disagree with that. One newspaper editor called him "a violent racist" others have called his far right wing views "distasteful in the extreme." However, his apparent murder on his farm has left many South Africans cold and fearful that this beautiful but deeply troubled country is again in the grip of racial hatred. Terreblanche's killing comes soon after a senior figure within the ruling African National Congress, Julius Malema, was barred by a judge from singing the anti-apartheid song, "Kill the Boer" or "Kill the farmer." The court ruled the song was tantamount to "hate speech." But the ruling party and its allies came out in defense of the song's violent lyrics, saying it reflected their heritage and struggle for freedom against the white apartheid government. And then the man who represented the worst of that old, apartheid South Africa is bludgeoned and hacked to death on his farm. He was apparently attacked while taking an afternoon nap. The connection was bound to be made; the coincidence just too much for racially sensitive South Africans. They are asking -- did that song incite two young men to kill the archetypal "Boer?" Was his death more than a criminal incident over unpaid wages? And will there now be reprisals against black South Africans by the small number of Terreblanche supporters, who will see him as a martyr? But South Africans were led out of the twisted specter of racial hatred by Nelson Mandela -- whose leadership and calm management prevented a potentially explosive conflict. But the bonds of nationhood that Mandela strived to build are still fragile, and many in South Africa fear that Terreblanche could be even more divisive in death than he was in life -- and tear apart a nation still struggling to let go of the past.